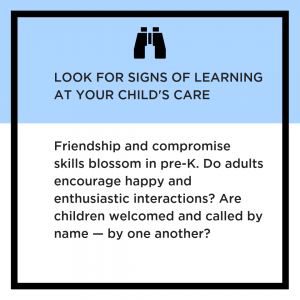 When I talk to expectant parents, I like to get past chatter about nursery themes or bottles vs. breast and get to the nitty-gritty: parenting is weird! And weird parenting is actually wonderful. In fact, research tells us that some strange habits have tremendously positive outcomes for children. And I’ve never seen a single baby-prep class that prepares moms or dads for any of that stuff. Diaper changes? Yep. Epidurals? Yep. Washing hands? You betcha. But the high-impact daily habits that require a complete 180-degree turn from adult life? Not so much. 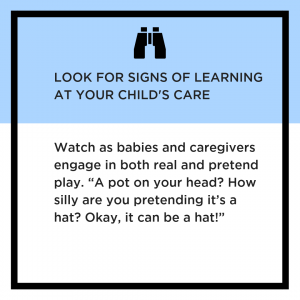 So, in an effort to get real about parenting, here are my four favorite things that are freaky (and pretty fabulous) about helping little ones learn and grow. They all felt a little awkward to me at first, but in retrospect, I know that they’re some of the best things that I’ve done for my son. As adults, it can feel pretty weird to chatter on endlessly, describing everything we do. After all, at a party, you’d rarely hear someone say, “Now, I’m picking up a chip. Next, I’ll get some dip. See, the chip goes in the dip.” That would be more than a little awkward. Want to learn more about the value of describing your actions and early word exposure? Check out article: Talking to babies boosts their brain power, studies show. Once I hit middle school, my pretend time was mostly gone. Other than a drama class here and there, imaginative time and make-believe were left behind with my Barbies. And play time? Well, there’s not that much room for that in daily life as an adult (though I wish there were more!). But great parenting involves a lot of pretending and a lot of playing. And I’ve decided that pushing through the weirdness of it is more than worth it — especially because the social scientists and early childhood experts tell me that it’s true. Pretending to understand your baby’s babbles helps them understand language. So, next time a bunch of adorable gobbledigook pops out, nod, respond and enthusiastically engage with your tiny conversationalist. (More info on this topic: Pretending to Understand What Babies Say Can Make Them Smarter). Playing at our children’s level can be a tricky process. But it can help them grow a lot! When they turn blocks and coasters into imaginary phones, it’s our job to answer. When they want to build a fort or pirate ship with pillows, we can help them. The most awkward part of this for me, was slowing down my own mind and letting my son drive the play. But I’m glad I did, because child-drive play is shown to encourage passions, decision-making, discovery and much more. The plans our children create for free play time are shown to produce great results! (More info on all the research around the benefits of play: The Importance of Play in Promoting Healthy Child Development and Maintaining Strong Parent-Child Bonds. And we can also make each of those playful moments a chance to learn. By asking and responding to their questions and prompts, we can help them think about the cause and effect of their actions. (More info on how questions drive learning: Using Questions to Support Your Child’s Learning). When I talk with other adults about our childhoods, I tend to hear about two pretty distinct ways that they were taught emotions. And many others were helped a lot in tricky situations, often with parents fixing big-feelings challenges for them. So, for those of us raised with either of those two habits, the evidence-backed practices of labeling feelings and coaching emotions can feel awfully awkward. But science tells us that helping little ones grow a rich emotional language can help them appropriately express themselves. After they have those words, emotion coaching helps them learn to problem solve. 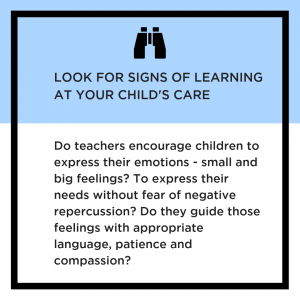 Emotion coaching involves some of the same steps as labeling, but takes it further with grown-ups expressing empathy and guiding the child through problem solving. On the flip side of that serious emotion coaching is the value of getting goofy. To be honest, I have a pretty silly, jokey relationship with my husband already. But an infant can’t get a punchline, and a toddler likes prat falls way more than a 30-something. So, we had to adapt our humor to get him giggling. And that’s come in handy more times than I ever would’ve guessed before we welcomed him into our lives. Silly faces made tummy time so much easier. Wacky voices got us through some difficult doctor’s appointments. And exaggerated examples of looking both ways helped us learn to cross the street, making the experience fun and the rules memorable. But this isn’t just my family’s experience. Research and early childhood professionals’ experiences support the value of humor in children’s lives, citing both how they support physical and emotional health AND serve as markers of cognitive growth. Laughter can have a big impact on our physical health. It releases mood-boosting endorphins and relieves stress. It also literally gets our blood flowing. We know that children begin laughing around four months of age. That’s when they know enough about the way the world works to realize when something is a little bit different. Unusual outcomes are the root of the first giggles. From there, at six months, silly sounds may prompt a guffaw. 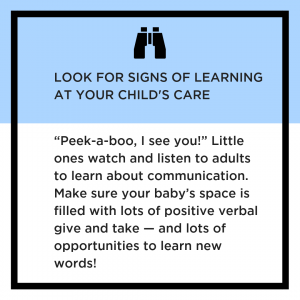 From there, babies start to love playing peek-a-boo. As toddlers’ word skills and awareness grow, they can start to understand visual and word-based humor. And, as any parent of a preschooler or pre-k jokester knows, they also begin to tell their own jokes after that. And while “Why did the chicken cross the road? To go tell someone about his day!” may not be immediately hilarious to us, laughing anyway is likely to help your child keep trying their hand at punchlines. Want a boost to understanding a child’s sense of humor or finding ways to be silly together? This guide from Parents magazine has some great ideas! Build Your Child’s Brighter Future! Bloom Bright shares simple ideas that spark learning and growth during family time. Parents can text “BLOOM” to 95577 or use our online form to sign up.